The cricket oval. The mown down green square turf in the middle. The sets of stumps at the two ends of the cricket pitch, with white lines marking out the popping, the return and the bowling creases. The lush green field, gently sloping down from the center square with the boundary marked out by a rope going round in an oval. The sound of the red cherry striking against the willow. These are all dream-like in the land of the rising sun! Still dream-like, but quite soon, one hopes, will be a reality in this land of sumo wrestlers. 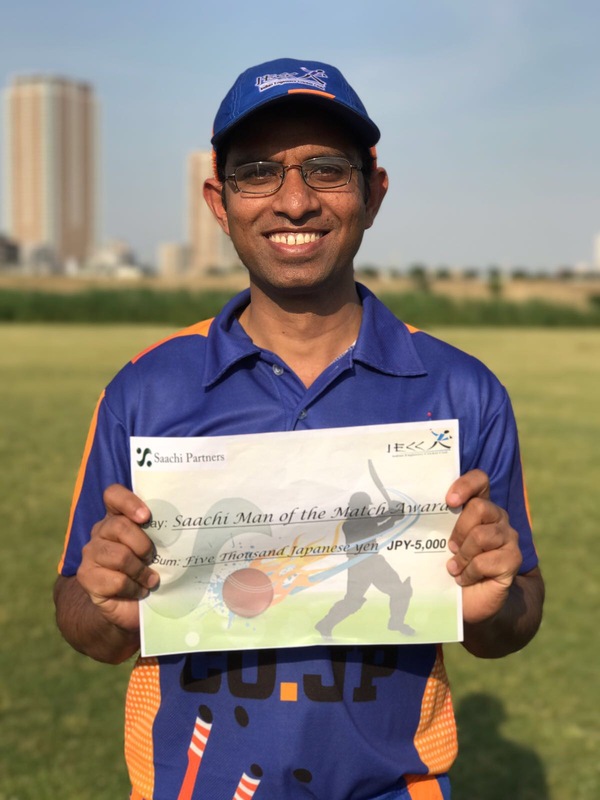 Perhaps, with these dreams and visions the organizers of Japan Cricket Association organized the first ever all-Japan cricket tournament that brought foreign and native cricket lovers from all over Japan. The setting was as idyllic as you can get. Set in Chiba, in the midst of a resort run by the Nihon Aerobic Center, the field looked big and green. And, the participants, all very enthusiastic. Some had flown in from as far as Kyushu! With such enthusiasm, it Just ideal for cricket! Match 1 (Nov. 23rd) As with any event in Japan, the six-a-side tournament started off bang on time. The inaugural match was played between Minami Kanto A and Minami Kanto B. The former managed 43 runs in their allotted 5 overs. Minami Kanto B, led by “Junior” Takahashi had no trouble knocking off 45 runs with 4 balls to spare. Match 2 (Nov. 23rd) Tokai, led by Kamran, won the toss and elected to bat. In the allotted 5 overs the team piled up 73 with Munir and Mahen remaining unbeaten with 32 and 16 respectively. Chasing such a formidable target Tohoku & Kita Kanto succumbed but managed a very-very creditable 57. Match 3 (Nov. 23rd) Minami Kanto B, choosing to bat first ran up a fairly big score of 66 with some good batting performance from everyone. Kansai, in reply, could not go beyond 36 because of some great bowling efforts by “junior” who bagged 3 for 8. Match 4 (Nov. 23rd) Electing to bat first, Tohoku & Kita Kanto managed just 39 in the allotted 5 overs. Kyushu brought about a pulsating one-run victory off the last ball due to some fielding panic displayed by their opponents. Match 5 (Nov. 23rd) Last match of the day, Tokai went into and equaled their previous score of 73. This time the two contributors were Viswa (24 not out) and Kamran (15 not out). In reply, Kansai could manage only 34, with Shahed returning wonderful figures of 2 for 4. End of Day One. And, time for fun and ohuro! The JCA, assisted by some sponsorship from Nihon Aerobics Center, organized a great evening full of fun, frolic and feasting. As a result, many players ended up going to bed late, but that did not prevent the organizers, ably supported by the umpires, from starting the next morning’s proceedings promptly at 8:30. Match 6 (Nov. 24th) Another nail-biting finish under a bright blue sky! Kyushu batted first and managed 56 in 5 overs. 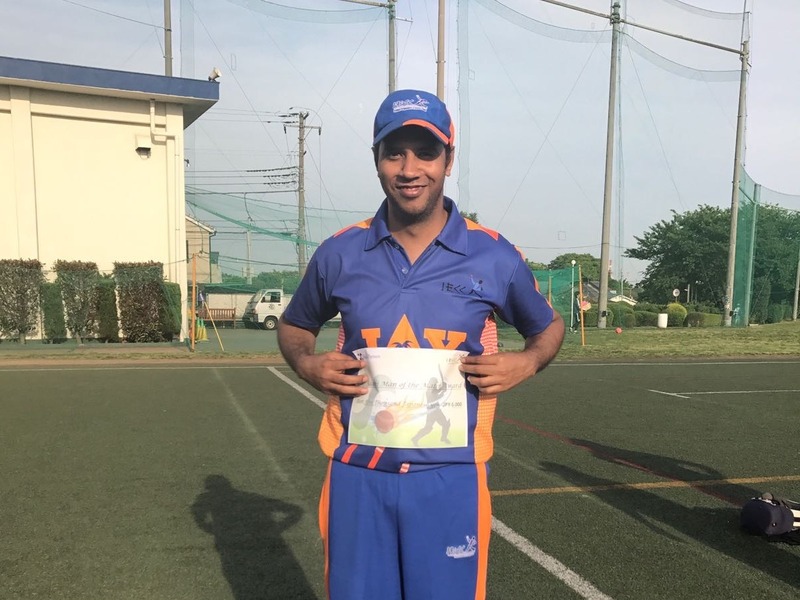 Their opponents, Minami Kanto A, was able to score the winning run off the last ball thanks to some great batting display earlier by Yato, who retired after having scored a quick fire 32. Match 7 (Nov. 24th) Third nail-biting finish of the tournament! Kansai batting first scored 57 in the allotted 5 overs. Tohoku & Kita Kanto managed the winning run off the last ball, thanks to some great team effort. Match 8 (Nov. 24th) Batting first, Kyushu managed just 45 in 5 overs. In reply, Minami Kanto B scored 49 with one ball to spare. Banjyo of the winning side made a wonderful contribution of 30 not out. Match 9 (Nov. 24th) Tokai, by now rated as the tournament favorites, batted first and managed a paltry 39 in the allotted 5 overs. However, the match turned out to be hard fought due to some wonderful bowling by Kamran and Mahen. Nonetheless, Minami Kanto A won the match with 3 balls to spare. Tokai learnt a good lesson: NEVER TAKE THINGS EASY IN CRICKET! By now, the lineups for the Bowl Final, the Plate Final, and the Cup Final had been decided. 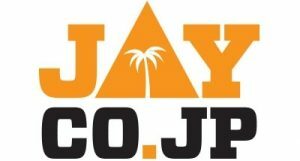 Match 10 (Bowl Final – Nov. 24th) Kansai was restricted to 49 off 5 overs due to some good bowling by Orita (2 for 6) and Yano (1 for 3). In reply, Tohoku & Kita Kanto scored 50 in 4.4 overs. Miyazawa scored an impressive 22 not out for the winning side. 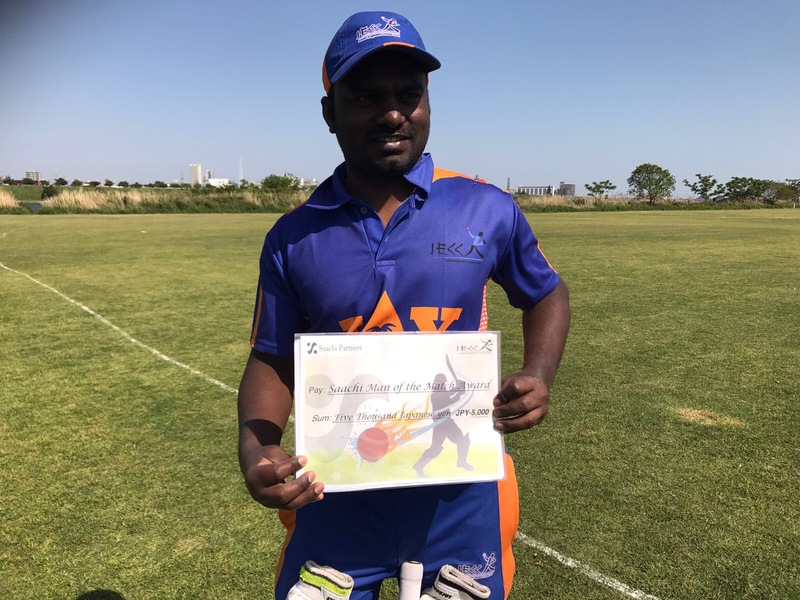 Match 11 (Plate Final – Nov. 24th) Kyushu batted first and managed 43 in 5 overs. Minami Kanto A ended the game earlier than was necessary by scoring 45 in just 2.4 overs. Some fine batting by Yoshioka who remained not out with 21. Match 12 (Cup Final – Nov. 24th) Unfortunately, the Cup Final turned out to be more of an anti-climax. Batting first and having learnt some lessons from their previous outing, Tokai piled up 72 runs in the allotted 5 overs. Everyone contributed to the score, with Munir and Robert remaining not out with well made 21 and 19 respectively. In reply, Minami Kanto B could manage just 43 in their 5 overs. So, Tokai took the cup home. But, thanks to some great organizing efforts by the JCA, the umpires, the players and the spectators CRICKET won that day. Everyone departed from the event with great hopes for the future of CRICKET in Japan. Perhaps, we all saw history in the making! We all look forward to bigger things, some CRICKET EXTRAVAGANZA in the near future in Japan.